I’m so glad you’ve dropped by for a little visit. Let me fill you in on why I created this website and how it can help. Before we dig in let’s get to know each other a little first. My name is Kathy and I live just outside of Austin. And I have a confession … I’m a reluctant cook. I wasn’t born with a spoon in my hand. I didn’t cook alongside my Mama when I was growing up. I only really developed an interest in cooking as a young mother trying to find healthier food for my family. It’s been a long circuitous journey to learn both how to cook and what to cook with lots of mistakes and course corrections along the way. I am still learning a lot about how to cook well. What to cook has become pretty clear in the past few years. And what I’ve learned through trial and error can help you and your family. There is so much contradictory information on what makes a healthy diet to be found online. No wonder most everyone is confused! Together we’ll tease apart this information and resolve the conflicts by going to the core of what’s important, what is the best possible proof of what a healthy diet looks like. That core is historical proof and it points to traditional diets as the best possible diet. … food philosophy are found in the recipes and articles found here. Sound contradictory? Let me explain 🙂 . In the 60s your Grandma made two very different cookbooks huge bestsellers. Really, they couldn’t have been more different. 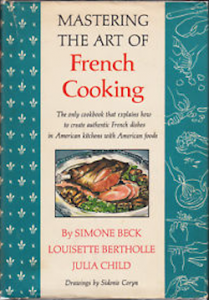 The first one you know about, ‘Mastering the Art of French Cooking’ by Julia Child. The second one, well, not so much … it’s recipes has not held up well over time. 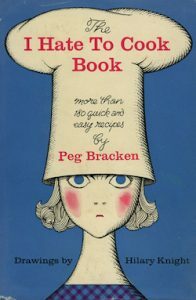 Peg’s writing style is simply hilarious though and it is so worth the read! It’s popularity showed that even in the 60s stay at home Moms were feeling a time crunch and were seeking shortcuts when cooking. Unfortunately most of the recipes involved processed foods that were new on the shelves at the time. This book was instrumental in helping women to feel good about the food shortcuts the food industry was promoting. Granny’s Vital Vittles is all about making creating nutritious meals from scratch as simple and easy as the recipes in ‘The I Hate to Cook Cookbook’ so you can fit everyday cooking into your already packed life. Moms didn’t have much time then and we for sure don’t have much time now! And I hope we’ll have a little fun on the way! No recipes calling for exotic or expensive ingredients. I’m on a budget and I know you are too. No guilt for a not 100% real food diet either. While I try to use the highest quality ingredients my budget allows, such perfectionism can be really demoralizing. Just do the best you can with what you have. I don’t mean growing old, though age is gaining on me, I don’t know about you 😉 . What I mean is let’s learn to make our food the old-fashioned way, the traditional way. Granny knew how to make everything from scratch. Granny used farm fresh ingredients in her cooking and we would be a lot better off if we did too. She made biscuits and gravy, fresh sourdough breads, sauerkraut and pickles, hams and roasts, and homemade desserts. Her food was delicious as well as nutritious. Her family and neighbors were mostly free of the modern diseases we suffer from. Illness’s that are caused by poor eating were largely unknown to all but the poorest of the poor in your Grandmother’s day. Let’s learn to be Granny Women in the midst of the hustle and bustle of modern life. We’ll need good planning and good habits to get there. Let’s build them together and keep each other company. Granny’s Vital Vittles is an Amazon affiliate. I receive a percentage of the purchase price on anything you buy through one of my Amazon links, including purchases you make while on Amazon that I did not link directly to. I am also an affiliate of US Wellness Meats and eBay.